Google Hangouts is a great service that makes it possible for you to interact with people through video calls and phone calls. If you have a Google Account, then you are able to take advantage of this free service. Unfortunately Google Hangouts can be a source of a lot of spam from unwanted contacts, and you might be tired of blocking and deleting strangers who randomly try to contact you through the service. 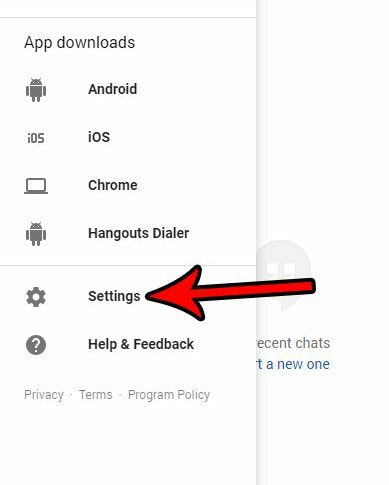 Our tutorial below is going to show you how to customize the settings in Google Hangouts so that these people can’t send you invitations through Hangouts. 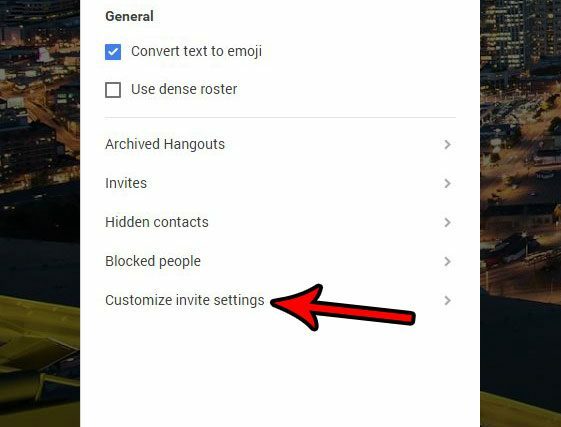 You can further customize Hangouts so that even people with your phone number and email address can only send you invitations, and you can also block people in your Google + circles, or turn off any invite notifications as well. 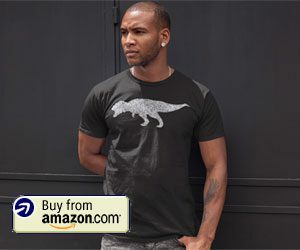 The steps in this article were performed in the desktop version of the Google Chrome Web browser. In this guide I am going to show you how to block all incoming Google Hangout requests. 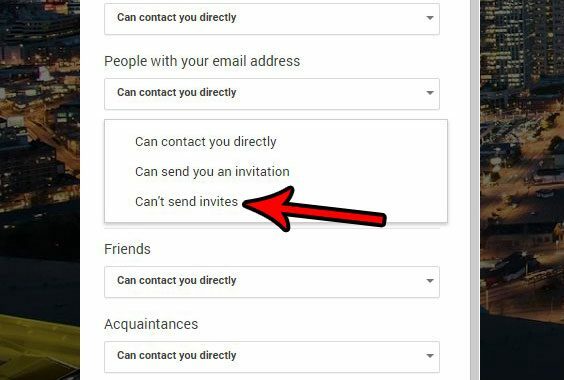 This means that no one will be able to send you an invite at all, even if they are a contact. Step 1: Open a Web browser window and navigate to https://hangouts.google.com. If you aren’t already signed into the Google Account for which you wish to block requests, you will be prompted to sign in. Step 2: Click the Menu icon at the top-left of the window. It’s the icon that looks like three horizontal lines. Step 3: Choose the Settings option near the bottom of the menu. Step 4: Select the Customize invite settings option near the bottom of the menu. 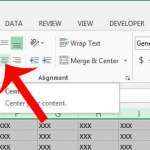 Step 5: Click the dropdown menu under Everyone else. Step 6: Choose the Can’t send invites option. 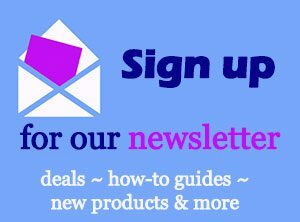 Note that some people that you may not want to contact you might have your phone number or email address. 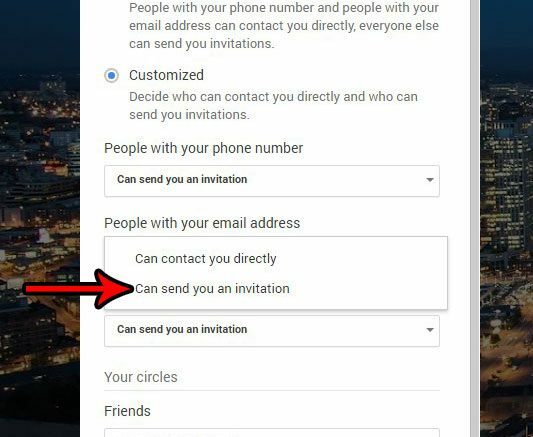 If you don’t want to let them contact you directly, then click the dropdown menus under People with your phone number and People with your email address and choose the Can send you an invitation option instead of the Can contact you directly option..
You can further customize your Hangouts experience by modifying the settings under Your circles as well. 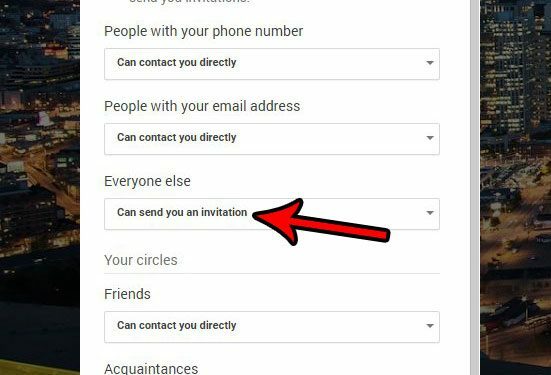 Additionally you can uncheck the Get notified about invitations box at the top of the menu if you don’t want to be notified at all about any invitations that you receive. 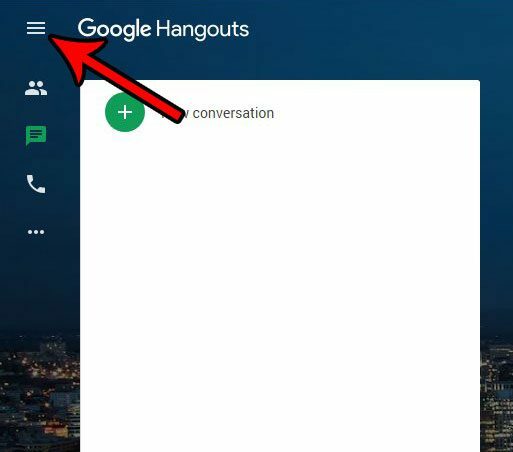 It’s possible that you currently have the Google Hangouts extension installed for Chrome as well. Find out how to remove the Hangouts extension from Chrome if you don’t need it. What is the Circled Number on a TV Show on the iPhone 5? What is the Lock Icon at the Top of My iPhone Screen?